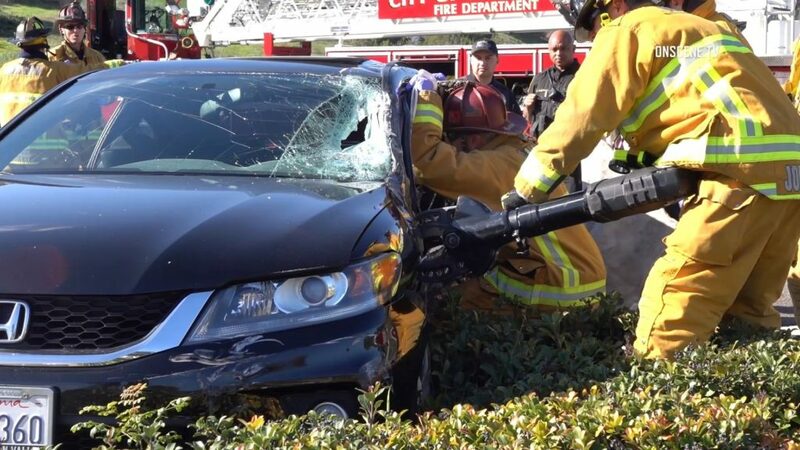 A woman had to be extricated Wednesday from the wreckage of a two-vehicle crash at a Chula Vista intersection. The collision was reported around 10:15 a.m. at the intersection of Telegraph Canyon Road and Paseo Ladera, Chula Vista police Sgt. Matt Smith said. Officers believe one of the drivers ran a red light, he said. Two Chula Vista Public Works employees witnessed the accident and helped rescued the female driver who appeared to be in medical distress. “I looked inside and saw she was unconscious so I grabbed one of our heavier tools and broke out the window and used the hook to pull the parking brake,” the employee told police. The woman was unconscious and her car was going in circles following the crash, the employee said. Firefighters used a hydraulic rescue tool, known as the “jaws of life,” to rescue the woman from the car, the officer said. Paramedics took that motorist, whose name was not released, to a nearby hospital with injuries of unknown severity. Dispatchers were initially told both drivers were injured, but the other driver apparently did not need to be taken to a hospital, Smith said.